I am starting to branch out and make all sorts of recipes with the Instant Pot Ace Blender. When I first purchased the blender I immediately went to what almost everyone does – make smoothies! I love the fact that you can layer your ingredients and just turn it on. No pushing the pulse button several times. No standing at the counter to manually turn it off when it reaches the right consistency. Just push the smoothie button and get on with your day. Come back a few minutes later and you have a cold smoothie waiting to be poured into your favorite cup! So after I got confident with the smoothie feature I decided to test out the heated element. The soup function seemed to be the next natural step. I made the most delicious Butternut Squash Soup that we have ever had. Plus, I didn’t have to stand over a hot stove stirring a pot! 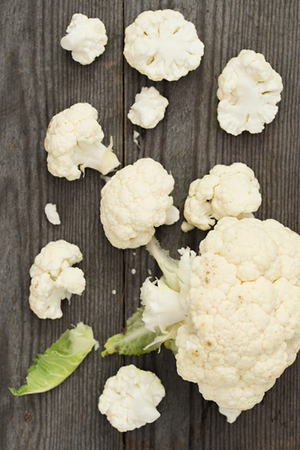 Break your cauliflower up into florets before putting it in the blender. 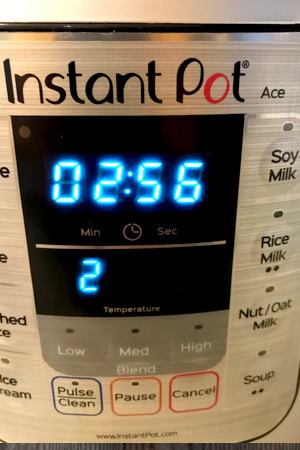 Put the ingredients in, push the soup button and in 20 minutes, you have hot soup ready to eat! Not only do I make coffee in the morning, now I make soup! As my coffee is brewing, I put all the ingredients in the blender. I then go get ready for the day and when I come back to the kitchen, the soup is ready! I pour the soup in a thermos, and when it’s time for lunch, I have a hot and healthy meal waiting for me! A HUGE time (and money) saver! And you will be amazed at how well it makes Dairy Free Alfredo Sauce! So when I opened the refrigerator door and saw a half head of cauliflower on it’s last few days, I knew I had to do something. Push the puree button and make sure it is on 2. Yes, I could have made fake potato soup using cauliflower instead of potatoes, but I wanted to try something new. 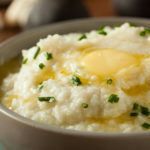 Keeping it simple, I wanted to see if I could make Instant Pot Blender Cauliflower Mash. I broke up the cauliflower into florets and put them in the blender. Because you must add some liquid when using the heat function, I decided to use vegetable broth. 1/4 cup is the minimum amount of liquid, and that is exactly what I used! Add in a few garlic cloves and some seasoning and it was ready to go! I pushed the puree button and made sure it was set on the number 2 setting. This setting is used to puree harder vegetables. I was worried at first that there wasn’t enough liquid to puree the cauliflower. Tiny bits seemed to be gathering around the edges of the glass. I remained patient and watched. As the pot heats up and the time goes by, the blender increases in intensity. During the last minute, the cauliflower was down to a puree consistency. Just like when I use my mixer, I dropped a tablespoon of butter in during the last 30 seconds of blending. 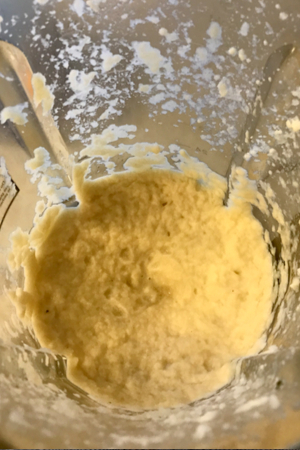 The results – Cauliflower mash made without steaming the cauliflower and best of all – using only one ‘pot’! I definitely will be making this again when I need a quick and healthy side dish! 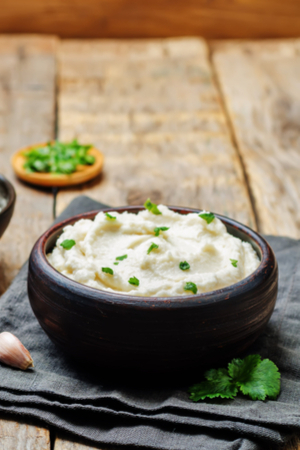 Cauliflower mash made with a push of a button and ready in minutes. Add cauliflower, vegetable stock and garlic cloves to the Instant Pot Ace Blender. Season with salt and pepper. Push Puree 2. Once there is one minute left, carefully open the plastic lid and drop in the tablespoon of butter. Once the cook time is up, Use a silicone spatula and pour into a bowl. Season with salt and pepper to taste.